As the title to this post says, I'm back to the grindstone after my break away in the beautiful environs of Italy's Liguria - based in Rapallo and taking in all surrounding coastal towns and villages, not forgetting the fantastic mountain sanctuary of Montellegro, with its astonishing views and peaceful setting. 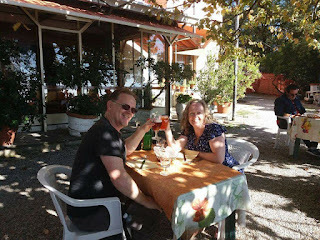 Bernie and I were spoilt rotten by the sun, the sea, the food - the people - the history and cultural depth of the area, and just about everything the Italian Riviera had to offer. Yes, a holiday there is highly recommended, but all great and wonderful things must come to an end, and ours came to a surprising thump in the name of Ryanair. We had four flights to make: Our first from Knock to London's Stansted, with our second flight connecting to Genoa next day, but that was cancelled in the initial flurry of Ryanair cancellations. We had notice so took it on the chin, booked a replacement flight for the following day, and made the best of London by staying in my son's for two very happy nights where we enjoyed time with my granddaughter and her family. We flew to Genoa and enjoyed a magical six nights (we lost one because of the cancellation) in Rapallo and its environs. Then we turned up at Genoa airport for our third flight, heading back to Stansted, only to be informed that our flight had been cancelled, without notice to us. Unbelievable, and with no Ryanair staff to connect with. Anyway, thanks to the airport staff, we got a fight for the next day and booked ourselves into the airport hotel for that night - lucky for us we had sufficient funds. Our main problem, though, apart from the shock of having a flight cancelled for the second time on our four-flight holiday, our connecting flight from Stansted to Knock in Ireland wouldn't be met at 10 am next morning, and our Airb&b stay was wasted because it was too late to cancel. What to do...? We went through language and geographical hoops to finally connect with a Ryanair contact, who basically promised to book us on a flight the following day, but I would have to call back in forty minutes to complete the booking. Of course, when I tried to call back, it was like leaping into the darkest, deepest hole, blindfolded and manacled. I was given numbers that rang out, with no way back to the original connection. Their Live Chat helpline also went AWOL. Lots of deep breaths at this stage, plus an Americano with a large shot of Bushmills. We decided to sleep on it and start again first thing next morning after breakfast, but we were too upset to tackle more than coffee. Anyway, we finally connected to their Live Chat and went through more hoops to clarify our situation with a contact who was obviously using English as a second or third language. He/she informed us that a flight back to Knock was available on the 22nd, four days later! Mamma Mai! After my other half dragged me back out of the computer-monitor's portal, I calmed down and we eventually got our contact to book us on a 10 pm flight to Dublin from Stansted - at least we'd be back on our island and a bus or train-ride away from Knock airport, where our car was parked, collecting added charges. But no, that flight would land at 11.30, so we'd miss the last bus connection. Was there no end to this? At this stage we were getting no further on the Live Chat so we took what we had and arrived at Stansted, with five hours to pass and the prospect of having to arrange an overnight stay in Dublin. Here's where Bernie took over. We went straight to Ryanair's Customer Service desk - I wasn't looking forward to what I envisioned would be a bloodbath. But that was before we met Kamal. This chap is a wonder - a calm, polite, and ultimately humane person, who went out of his way to accommodate us once we explained our situation and showed him our paper-trail of Ryanair-inflicted torture. He deserves special commendation in this narrative. Long-story-short, he got us onto an 8 pm standby flight to Dublin, due in shortly after nine, which meant we could get a bus back to Sligo and our bed, which meant we just had to get another bus to Knock airport this morning to collect the car (Bernie looked after that). We're going to sit down later and put all our receipts and documents together before connecting with Ryanair's claims' contact, though I'm sure it'll be a form-filling exercise more than actually communicating with a human. We live in hope that we'll be reimbursed for our expenses and compensated for our inconvenience. So, now I'm back at my desk, loose ends sorted, ready to get back into what I love and do best - editing. While this runway is fairly full, there will be no cancellations, and all will be accommodated in good time. I may not be a Kamal, but I make a point of looking after my clients and their interests. They know that, which is why they stick with me, and they are appreciated for that. If you have a novel or memoir that you feel is ready for a professional edit, drop me a line at clearviewediting@gmail.com and we can have a chat about your options.